Autumn is just the perfect season to host dinners on weekends. You can call your friends, family members and colleagues to have a warm, cozy meal together. Of course, what needs attention is the list of arrangements. Of course, you need to call a reliable caterer or delivery service for food, but what about décor? 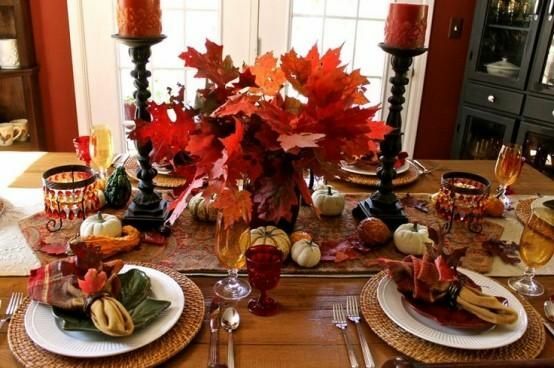 In this post, we bring a list of things that matter for autumn dinner parties. Love the season. Autumn is all about soft, warm colors, and the party needs to be reflective of the same. Of course, local autumn flavors may differ, but a cozy setup just works wonders. Get the rugs out, add a few candles, use the diffuser for adding a few scents, and you have a welcoming home. Allow the scents to spread. You will find specific home fragrance ideas for the season; think of choices like cinnamon, star anise and cloves, and you can also choose to use some of the essential oils in a diffuser as stated above. Lights for the mood. There’s no denying that lighting sets up the mood for the season. The best thing about autumn lighting is the fact that things don’t have to be extremely over the top.. Even when you haven’t spent enough on extra décor, power of lighting can do the trick. Detailing is the key. Regardless of the season and other things, you have to pay attention to the smaller details. Go for more home decor accessories, which can add more vibe to an otherwise more mundane setup, and this doesn’t have to be expensive. Freshness of the flowers. There is no denying that fresh flowers work wonders for any event or party, and you can get some for your home at really affective prices. The idea is rather simple – choose flowers that are indicative of the mood and occasion. Setting the table right. Finally, your guests will be on the dining table, where the table settings make the difference. It is best to have a table plan in place, so that you can arrange the guests in a way that everyone gets company of those they like. Guests usually like to be directed, so create a plan and stick to it. Finally, check for tableware sets. You will find a bunch of choices, right from simple ones to textures and more, which can be handy in creating a mixed theme. Check online to shop for the right things! How Long Does Freon Last In A Central Air-Conditioning Unit?